The UrbanWire attends the third installment of the S.O.Y, or Start-of-Year Cosplay event. An April Fool’s joke circulated online claiming that the S.O.Y C, or Start-of-Year Cosplay event in Singapore was cancelled. Undeterred, more than 3,600 fans of cosplay, or the hobby of dressing up as mostly anime characters, streamed into the Convention Centre at Ngee Ann Polytechnic throughout the day on Apr 10. Dressed in costumes to resemble Naruto Uzumaki, Godzilla and even Patrick Star from SpongeBob Squarepants, they mingled and showed off their outfits and accessories during the 7-hour-long event. 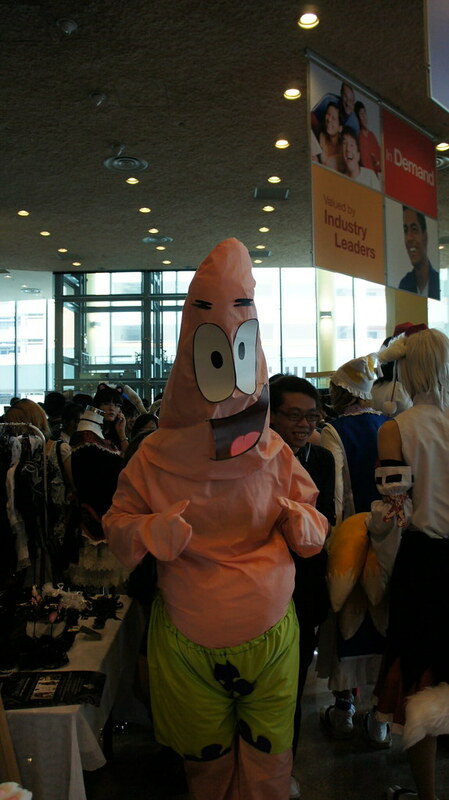 This cosplayer saw the lighter, non-anime side of things as he came dressed in a makeshift Patrick Star costume. This year’s event is the third, and the most massive, installment of the S.O.Y.C. to date. “During the first S.O.Y, the targeted number of participants was only 400 to 500 people. This time, we are targeting around 3,000 people,” event organiser Julia Huang, 19, said. As the number of participants grew over the years, so did the need for a larger venue. The organizers, Ngee Ann Polytechnic’s Japanese Tsubasa Club, may have started out at the small holding area outside Lecture Theatre 26 in 2007, but soon expanded to the basement of the Convention Centre, before booking the Convention Centre itself. Even while fun was topmost on everyone’s mind, the event also supported the Singapore Red Cross Society‘s appeal for donations in the wake of the massive earthquake and tsunami Tōhoku, which has killed tens of thousands of civilians off the east coast of Japan. Booths peddling accessories like wigs, earrings and toys lined the main lobby of the venue. Hordes of young children and even teenagers clamoured to grab anime collectibles, such as plastic figurines and stuffed toys bearing the likeness of Pokémon characters. It was hard to resist the cute and innovative toys on display. Seth Chan, 23, added a dancing Felyne music speaker to his collection of music gadgets. 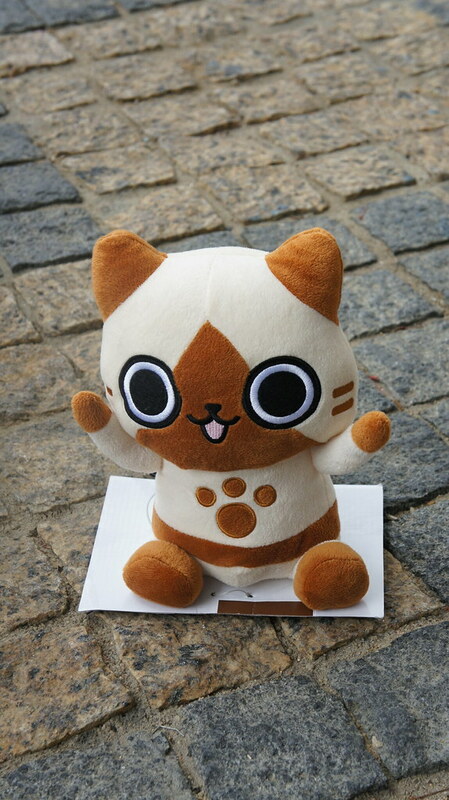 “It’s cute!” he remarked, referring to the character from the Capcom game Monster Hunter. Felyne MP3 speakers, like this set were up for collection on the event day. There was more to the event than just shopping. Fans of the fighting game BlazBlue were treated to a thrilling experience as a BlazBlue competition was held for gaming enthusiasts. That was not all. Cosplayers themselves had much to cheer about as the best dressed cosplayers stood a chance to win a mystery prize and a Samsung camera worth over $800. And dress well, many of them did. A cosplayer who wanted to be known only as Gwen, cross-dressed as Kaito, a character from the Vocaloid Song, Secret Police. Gwen attributes her penchant for cross-playing to her fascination with suits and coats. As the event progressed into the lunch hour, volunteers and members of the Japanese Tsubasa Club unveiled a novelty measure to cater to famished and thirsty participants. They worked through the morning to put up a new, special attraction in the compound – a mini Alice in Wonderland-themed café. It was stowed away in a cosy corner of the Convention Centre, right behind the entrance to the stage. Still, what caught The UrbanWire’s eye were the tofu cupcakes on the menu. The pastries, adorned with smileys and even rose-shaped cream, looked a tad too artsy for consumption. As if the strategy of having waitresses dressed in French maid costumes wasn’t appealing enough, the café took promotions to a whole new level – by getting volunteers dressed as tofu cupcakes to do walkabouts, to ‘lure’ potential customers to ‘eat’ them. Precisely because of how successful S.O.Y C was, fans and cosplayers are in for great disappointment, as Julia revealed that plans for a subsequent cosplay event have hit a snag. “We don’t foresee ourselves having an event next year because we have serious event constraints, so plans for it will tentatively be on hold,” she lamented.